Valentine’s Day is at hand and you will be worrying your head, thinking about the most suitable gift for your beloved. It has to be unique and impressive. It has to be romantic and at the same time useful. How about a music box? 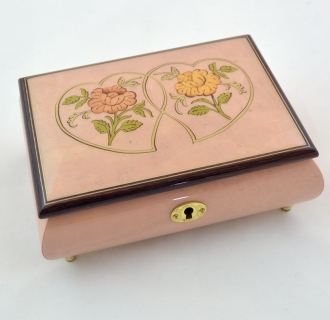 Our music box inlaid with two hearts is just the thing for you. Your sweetheart cannot be but overjoyed by it, especially when she can keep some of her prized jewelry items in it. 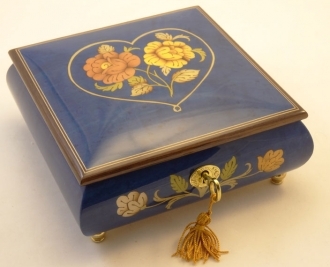 Make and Design – This is a fabulous music box, which is handmade in Sorrento, Italy. The workmanship of the box is of the highest order. The white gloss finish with the cream designs lends the box an exquisite charm. The two intertwining hearts with flowers talk volumes about the love you cherish for your beloved. These Sorrento music boxes exemplify a blend of sophistication and class. 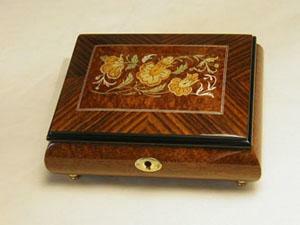 These velvet inlaid boxes are large enough to hold a substantial item of jewelry. It is 5.25 inches long and 6.75 inches wide. The height of the box comes to 2.75 inches. The inside of the box is lined with soft deluxe velvet, so that the polish of the jewelry is perfectly safe in it. 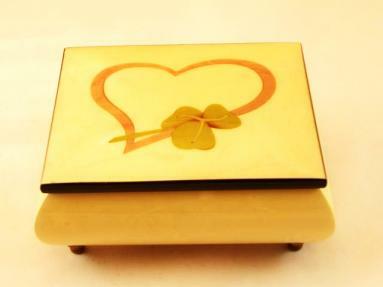 The shape of these Sorrento inlaid boxes is very beautiful. The lower part of the box has smooth rounded contours. The lid is flat with beautifully rounded edges. The dark gloss edges highlight the white finish of the lid and the romantic inlay. The tiny legs are golden and they are tastefully shaped to give the box a wonderful finish. Music Selection – There is a provision to select the movement of the music. You can select between an 18-note Sanyo (Japan) movement, which can be upgraded to an 18-note Swiss Reuge movement for an additional $22, if you want to heighten the romantic feel. Thereafter, you can have a number of romantic tunes in our collection, to choose from. After sale info – Shipping is free in USA. You can buy our reuge music boxes without the fear of a money loss. The music boxes are guaranteed to give you complete satisfaction. But just in case you find something about our inlaid boxes not up to your expectation, you are free to return them within 15 days. You will get your money back after the reduction of shipping charges. Rules for Returning the Merchandise – We should be informed before you send the item back, so that we will be expecting the package. Please return the Sorrento inlaid boxes without any kind of damage. They should be packed in the original packing materials. The packages should be sent through Fed Ex, UPS or as Insured Priority Mail. This is to protect you from eventualities that may arise from damage or loss in the transit. Customer Service – You will find our customer service to be very effective. Any email we receive will be answered as soon as possible. All your requests and complaints will be attended to immediately. The Sorrento Music boxes are most suited for an occasion like Valentine’s Day. They sure have an aura of romance about them.